Small Class B Climax locomotive owned by the Oregon Lumber Company. 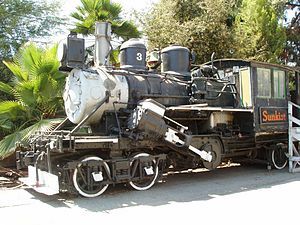 Class C Climax locomotive Fruit Growers Number 3 on display at Fairplex in Pomona, California. Climax 1694 at Emerald, Victoria preparing for a charter tour. The invention of the Climax locomotive is attributed to Charles D. Scott, who ran a forest railway near Spartansburg, Pennsylvania between 1875 and 1878. A lumberjack of considerable mechanical ingenuity, Scott sought to bring an improved logging locomotive of his own design to market and brought the drawings to the nearby Climax Manufacturing Company in Corry, Pennsylvania. The first four Climax locomotives were built and delivered in 1888. The design patent was filed in February in the same year and granted in December. The invention was not patented in the name of Scott, as he had only a limited education, so he left the drawings to his brother-in-law George D. Gilbert, who was a civil engineer by profession and worked for Climax. Gilbert had the invention patented in his name without mentioning Scott. Truck with differential as proposed by Gilbert, which was later not used anymore. The patent of Gilbert used an upright maritime type two cylinder steam engine, a 2-speed transmission and a drivetrain in the underframe passing just above the axle centers. The patented differential for transferring the power from the drive shaft to the wheels was only used in the very first Climax locomotives. In a similar way to that used in an automobile, the force was transferred to the two wheels of an axle separately, with one wheel being firmly connected to the wheelset shaft and the other wheel being able to rotate loosely on a sleeve around the wheelset shaft. The idea of the differential transmissions was to reduce resistance on tight bends by allowing a wheel to turn at idle or with fewer revolutions than the one at the other end of the axle. The design did not prove workable, because when driving at the adhesion limit, less tractive effort could be exerted compared to locomotives with rigid wheelsets. Fig. 1 of US Patent 455154 by Battles showing the prototype of the Class B Climax locomotive. Rush S. Battles patented the basic design of the drivetrain without the differential, just using simple hypoid bevel gears to drive the wheelsets with normal fixed wheels. Unlike the later and somewhat similar Heisler design, there were no side rods on the trucks and all gearing was open, exposed to the elements. A further patent from 1891 describes a locomotive with horizontal cylinders connected to the drive shaft through a 2-speed transmission. Battles' patent describes the core design that became the Class B Climax, and his patent illustrations show the name Climax emblazoned on the locomotive cab. Charles D. Scott, who had previously proposed a less successful geared steam locomotive, filed a lawsuit against Gilbert and Battles and applied for a patent in his own name, which was granted to him after a lengthy legal dispute on 20 December 1892. But the lawsuit left Scott penniless because he could hardly benefit from the invention. The patent of Scott showed the arrangement of the steam engine, boiler and two-speed gearbox in accordance with Gilbert's patent while the drive without differential gearbox was described in accordance to the patent of Battles The patent of Scott corresponds to the most common design of Class A Climax locomotives. In 1893 Scott proposed a geared steam locomotive, in which the frame of the boiler was hinged to the frame of the tender. The running gear underneath the boiler was firmly connected to it and was driven by common lateral cylinders and side rods. Underneath the tender was a truck which was similar to the Climax locomotives driven by a central shaft which took the power from the front axle of the locomotive via a hypoid bevel gear. For the first time, the design used closed axle drives with housings on one hand protecting the gear unit from and on the other hand also containing the gear lubricant. All Climax locomotives were built by the Climax Manufacturing Company (later renamed to the Climax Locomotive Works), of Corry, Pennsylvania. In addition, an agency and service facility was established in Seattle, Washington to sell and maintain locomotives for west coast buyers. Production began in 1888 and the last Climax locomotive was produced in 1928. Between 1000 and 1100 were built. Many loggers considered the Climax superior to the Shay in hauling capability and stability, particularly in a smaller locomotive. This was due to its fully sprung truck arrangement; the Shay locomotive had no springs on the bogie on the drivetrain side and was therefore not fully able to compensate for twists in the track. The ride on the large class C Climax was characteristically rough for the crew, since the imbalance of the large drivetrain could only be compensated for one speed. These featured a steam engine unit with two vertical cylinders mounted in the center of the locomotive. Class A Climaxes had a frame similar to a flatcar with wooden boxcar-like bodywork built up above it to protect the crew and fuel from the elements—this could be more or less covering between locomotive to locomotive. The front half of the locomotive, in front of the engine unit, contained the boiler. In smaller examples this may have been a vertical boiler, while in larger ones a tee boiler was employed. Class A Climaxes were small locomotives, generally under seventeen tons. Class A Climaxes, unlike Heisler and Shay locomotives, had two-speed gearboxes. Looking more like a conventional steam locomotive, the Class B Climax had the cylinders either side of the boiler, permitting it to be longer and larger than possible with the Class A arrangement. The two cylinders drove a transverse shaft that was geared to the longitudinal driveshaft in the middle; on early Class B climaxes, the cylinders were horizontal and pointing forwards, while later ones had the cylinders angled upwards at about 30 degrees from horizontal. Class B Climaxes weighed approximately 17 tons at minimum to a maximum of approximately 60 tons. A class C was a three-truck design, the additional powered truck being beneath a water-carrying tender articulated to the locomotive. This allowed the locomotive to operate for longer periods of time before needing to stop for water. All Class C locomotives had inclined cylinders. Approximately 17 Climax locomotives survive in North America, of which about five are operational. Two survive in Australia: No. 1694, restored and operational since 8 September 2013, at the Puffing Billy Railway, in Belgrave, and No. 1653, on display at Hobart, Tasmania. The New Zealand Climaxes are No. 522, stored at Tokomaru, No. 1203, stored in Shantytown Heritage Park near Greymouth, No. 1317, under static restoration at Te Awamutu, and No. 1650, as of 2013 under restoration at Pukemiro. Hence, four of the seven Climax locos delivered to New Zealand have survived. The Climax locomotive at the Cass Scenic Railroad State Park in West Virginia is being restored by the Mountain State Railroad & Logging Historical Association. The White Mountain Central Railroad located off Interstate 93 in Lincoln, New Hampshire uses Climax #6 as the primary or main locomotive. The "Durbin Rocket", of the Durbin and Greenbrier Valley Railroad in Durbin, West Virginia, is hauled by a Climax on its regular excursions. The Corry Historical Museum in Corry, Pennsylvania has a Climax on display in its own exhibit room inside the museum, with the locomotive sitting on a section of track. The museum is open from 14:00 to 16:00 on weekends from Memorial Day to Labor Day, and admission is free. A restored Climax locomotive is on display at the Railroad Museum of Pennsylvania, located in Strasburg. It is displayed beside a Heisler locomotive and a Shay locomotive, which are also fully restored. The locomotives are not in operating condition. Two Climax locomotives are preserved in Canada, both at the BC Forest Discovery Centre in Duncan, British Columbia. Shawnigan Lake Lumber Co. No. 2 is a 25-ton Class B locomotive, and was built in 1910 as shop number 1057. Hillcrest Lumber Co. No. 9 was built to a larger, 50-ton Class B design in 1915, and is Climax shop number 1359. Hillcrest Lumber Co. #10, the larger locomotive weighing 70 tons, is now operational at Mt. Rainier Scenic Railroad at Elbe, Washington. One Class B Climax is preserved on the grounds of the Cradle of Forestry in North Carolina. A number of Climaxes, especially Class A, were later converted to diesel or gasoline power, and some still exist in this form, using the original frame and drive mechanism. In the animated television series Thomas & Friends, the character of Ferdinand is based on the Climax Class C locomotive. ^ a b Vasser, Ed. "History Of The Climax Locomotive". Climax Locomotives. Retrieved 2018-03-12. ^ a b Rush S. Battles, Locomotive, U.S. Patent 421,894, February 25, 1890. ^ Charles D. Scott, Locomotive for Tramways,U.S. Patent 452,124, May 12, 1891. ^ Charles D. Scott, Locomotive for Tramways, U.S. Patent 488,484, Dec. 20, 1892. ^ Charles D. Scott, Tramway Locomotive, U.S. Patent 504,541, September 5, 1893. ^ Vasser, Ed. "History Of The Climax Locomotive". Climax Locomotives. Retrieved 2018-03-12. ^ "Climax Locomotive No. 1694 Recommissioning". Puffing Billy Preservation Society. Retrieved 2013-09-10. ^ "Exhibit - Climax". Tasmanian Transport Museum Society. Retrieved 2015-10-08. ^ "Our Trains: Shawnigan Lake Lumber Co. No. 2". BC Forest Discovery Centre. Retrieved 5 September 2014. ^ "Our Trains: Hillcrest Lumber Co. No. 9". BC Forest Discovery Centre. Retrieved 5 September 2014. ^ "Train History Day". Cradle of Forestry. Retrieved 28 March 2018. ^ Vasser, Ed. "Surviving Climax Locomotives". www.climaxlocomotives.com. Frankfort, Kentucky. Retrieved 2018-03-12. ^ "Ferdinand - Character Profile & Bio". Thomas & Friends - Official Website. Retrieved August 26, 2017. Wikimedia Commons has media related to Climax locomotives. [https://s3.amazonaws.com/SIMONTON/1551.pdf A 3D pdf of Climax CN 1551 as restored at Cass, West Virginia may be found here. Requires Adobe Acrobat or Acrobat Reader as browser pdf previewers do not allow 3D features of the pdf file. The drawing may be zoomed, rotated, and parts hidden to reveal interior and otherwise concealed parts. The parts in the 3D pdf are somewhat simplified as Acrobat has simplified the file for "printing". Drawing prepared from five years work at Cass, West Virginia documenting the locomotive in 3D CADD. This page was last edited on 24 March 2019, at 13:14 (UTC).